We've recently returned from the 2014 EMLA Retreat, where, had you managed to catch her at the right moment, you'd have seen Cynthia Levinson sitting with a very thick biography of Hillary Rodham Clinton and a notebook, reading carefully and taking notes. And while we were retreating, news was released into the world about WHY: Kristin Daly Rens at HarperCollins's Balzer & Bray imprint has signed Cynthia up to do a middle-grade biography about our former U.S. Secretary of State, Senator, and First Lady. The release is coming up soon, in winter 2016, so Cynthia has a LOT of quick reading and writing ahead of her. Congratulations, Cynthia--and much energy to you (as if you need it!). Have we negelected to show off the great, new cover of IF YOU'RE READING THIS by Trent Reedy? Well, no longer! Out on August 26th with Arthur A. Levine Books, IF YOU'RE READING THIS is sure to win readers over just like Trent's other books. 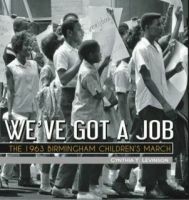 Kirkus Reviews is already calling it a "moving study of war's long-reaching effects on families." Best of luck and congratulations, Trent! A happy, happy book release day to Jennifer Ziegler and REVENGE OF THE FLOWER GIRLS! To put it in Jenny's own words, we "hope it goes out into the world and makes friends, finds its place, and spreads a bit of joy." It's a beautiful book and we're thinking it will do all those things. Congratulations, Jenny! Here it is! 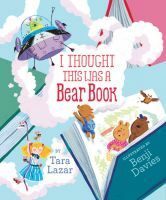 The cover reveal for Tara Lazar's lovely I THOUGHT THIS WAS A BEAR BOOK, pubbing in 2015 from Aladdin. Look at the magic illustrator Benji Davies has made of it. Congratulations, Tara! HOP ON BOARD THE BUNNY BUS! Joy Peskin at FSG has acquired world rights toBunny Bus, a picture book by Ammi-Joan Paquette, illustrated by Lesley Breen Withrow, whose sample illustration inspired the story. In the story, the Bunny Bus seems to have room for one and all, but what happens if there is one passenger too many? 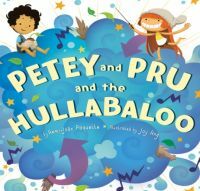 It is set to publish in winter 2017; Erin Murphy at Erin Murphy Literary Agency represented the author, and Chris Tugeau at CATugeau Agency represented the illustrator. All this came about because of an illustration by Lesley Breen Withrow, which can be seen in the portfolio on her agent's website. Adorable animals boarding a bus that is also a bunny? Yes, please! Joan had the perfect rhyming story for very young picture book readers, and we're off and running--well, strolling, as the book won't publish until winter 2017 (in time for Easter, of course!). As a side note, I'm so happy to be doing a book with Christina Tugeau, the artist's agent, after knowing her since the very early days of EMLA. Dancing Its Way into Children's Hearts! 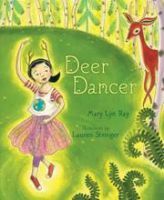 Happy, happy book birthday to Mary Lyn Ray's DEER DANCER today! This book is already garnering high praise and we can't wait for it to reach the hands of readers everywhere. Congratulations, Mary Lyn! This picture book is a thing of beauty. Pat Zietlow Miller Is A Very WIDE-AWAKE BEAR! You would think that by now we'd have run out of fabulous things to say about Pat Zietlow Miller. ...But you'd be wrong! So wrong! Between you and me, I think there may be no limit to the great stuff Pat's got in store on the near horizon. While we await yet more specifics, I'm delighted to share the latest exciting development—and it's one which has been in the works for some time but which can finally be shared with you. 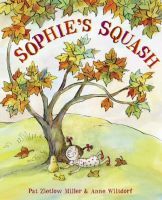 SOPHIE'S SQUASH author Pat Zietlow Miller's WIDE-AWAKE BEAR, about a bear cub who wakes up far before the expected spring and can't seem to get back to sleep, no matter what he tries, to Alexandra Cooper at Harper Collins Children's, by Ammi-Joan Paquette at Erin Murphy Literary Agency (World). Hooray to Pat, and to all you wide-awake bears out there who will get to burn the midnight oil along with her!